Hackensack Meridian Health Hackensack University Medical Center recently celebrated the gift of life: organ donation. 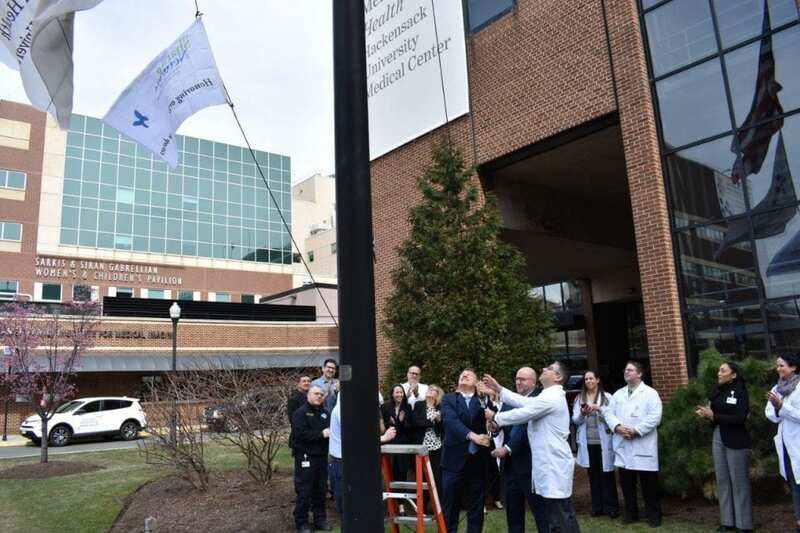 To commemorate National Donate Life Month, the medical center raised the New Jersey Sharing Network Flag to honor organ and tissue donors. In 2018, Hackensack University Medical Center received national accolades by being honored with platinum status by the U. S. Department of Health and Human Services for raising organ and tissue donation awareness. Hackensack had a record year with the most organ transplants in the program’s history with 94 transplants and 25 of those living donors. The integration with the New Jersey Sharing Network has brought education and awareness to the medical center’s team members and patients to save lives through organ donation. 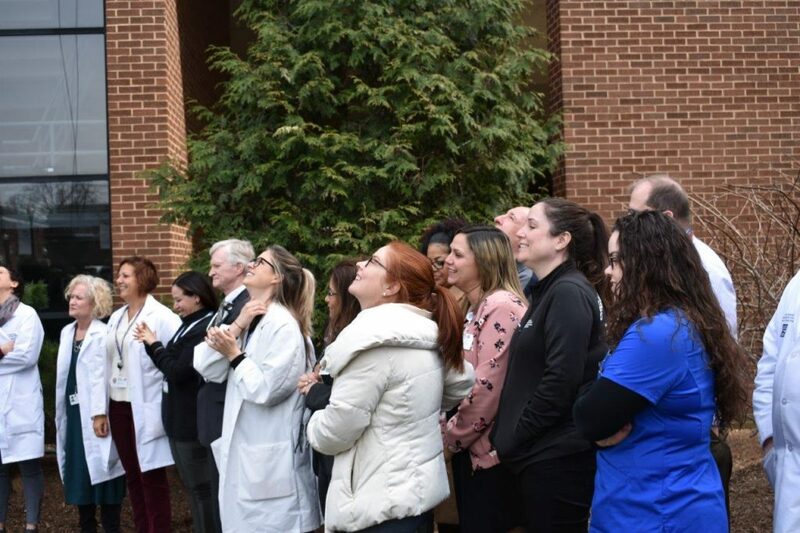 The Organ Transplant team and Donor Council were present to assist Mark D. Sparta, FACHE, president and chief hospital executive of the medical center, in raising the flag. According to the United Network for Organ Sharing, nearly 114,000 people in the United States are in need of a lifesaving organ transplant. Hackensack Meridian Health Hackensack University Medical Center, a 781-bed nonprofit teaching and research hospital located in Bergen County, NJ, is the largest provider of inpatient and outpatient services in the state. Founded in 1888 as the county’s first hospital, it is now part of the largest, most comprehensive and truly integrated health care network in New Jersey, offering a complete range of medical services, innovative research and life-enhancing care, which is comprised of 34,100 team members and more than 6,500 physicians. Hackensack University Medical Center was listed as one of the top two hospitals in New Jersey in U.S. News & World Report’s 2018-19 Best Hospital rankings. It was also named one of the top five New York Metro Area hospitals. Hackensack University Medical Center is one of only five major academic medical centers in the nation to receive Healthgrades America’s 50 Best Hospitals Award for five or more years in a row. Becker’s Hospital Review recognized Hackensack University Medical Center as one of the 100 Great Hospitals in America 2018. The medical center is one of the top 25 green hospitals in the country according to Practice Greenhealth, and received 25 Gold Seals of Approval™ by The Joint Commission – more than any other hospital in the country. It was the first hospital in New Jersey and second in the nation to become a Magnet® recognized hospital for nursing excellence; receiving its sixth consecutive designation in 2019. Hackensack University Medical Center has created an entire campus of award-winning care, including: the John Theurer Cancer Center; the Heart & Vascular Hospital; and the Sarkis and Siran Gabrellian Women’s and Children’s Pavilion, which houses the Joseph M. Sanzari Children’s Hospital and Donna A. Sanzari Women’s Hospital, which was designed with The Deirdre Imus Environmental Health Center® and listed on the Green Guide’s list of Top 10 Green Hospitals in the U.S. Hackensack University Medical Center is the Hometown Hospital of the New York Giants and the New York Red Bulls and is Official Medical Services Provider to THE NORTHERN TRUST PGA Golf Tournament. It remains committed to its community through fundraising and community events especially the Tackle Kids Cancer Campaign providing much needed research at the Children’s Cancer Institute housed at the Joseph M. Sanzari Children’s Hospital. To learn more, visit www.HackensackUMC.org.